This house was built in 1900 and originally sat on Back Road somewhere across the street from Fig Tree Lane. Later, it was moved to the location shown on the map. In 1983, it was moved again and the Anchorage Inn was built on this property. Since then, it has served as the home of several businesses. As you look for it, realize that the house no longer has the ell on the back. Instead it has a simple shed-roof addition. I can't wait. Where is this building now? This building was moved to the Community Square. 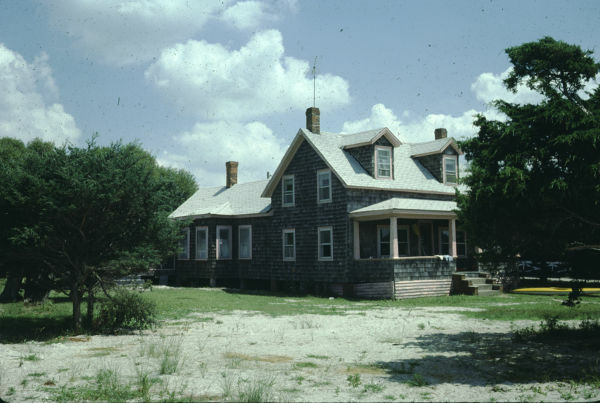 After its move, it became The Old Ocracoke Gathering Place (more commonly referred to as simply The Gathering Place). The small room on the back is now used as the information station for Ocracoke Civic and Business Association where you can obtain brochures on local businesses.